Fontvieille, is a typical Provencal in appearance and atmosphere but can be touristy at times, maybe not recommended for a traveler who’d rather visit “off the beaten path villages”. This village has several little hotels and restaurants serving thousand fans of Alphonse Daudet who stop off before or after a visit to the nearby Moulin de Daudet ( Daudet’s windmill), where this very famous author wrote his best-loved work, Lettres de mon moulin ( letters from my mill). In reality, while Daudet spent time at the mill, most of the writing was done back home, in Paris; but the mill certainly provided an excuse for an outing and a picnic. Accommodation and Food in Fontvieille. Hotel Le Daudet, Avenue de Montmajour; Phone # 04-90-54-76-06 ; A modern and peaceful hotel with pool and terrace with comfortable rooms. Closed October through Easter. La Regalido, Rue F Mistral. http://www.laregalido.com. Tranquil, fragrant garden setting for this elegant hotel and restaurant full of rural Provencal atmosphere. The restaurant pays homage to the olive oil in its crudites with tapenade, garlicky leg of lamb, freshly caught fish simmered in olive oil, olive oil ravioli and olive omelette. Very nice breakfasts are served on the terrace. St-Remy-de-Provence. is a perfectly untouched base. Mansions built during the 15th and 16th centuries grace its historic centre.It has a picturesque old quarter of lanes, squares and fountains, and avenues shaded by leafy plane trees.Some famous names such as the astrologer Nostradamus ( 1503-1566) who was born here, and Gertrude Stein who stayed for a year ( 1922) in the hotel de la ville verte. 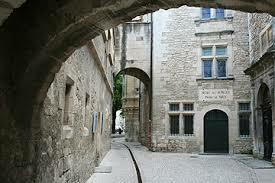 One of the mansions was home of the Sade family, ancestors to the notorious Marquis de Sade. 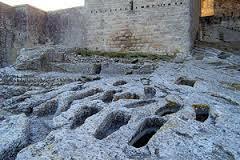 There are several Appellation Controlee Coteaux d’Aix en Provence and Les Baux wine makers around the area. Four kilometers east on the D99, a side turns leads down to the impressive underground “Cathedral” caverns de Chateau de Romanin, which produces and AC wine, supposedly since the 4th-century bc. 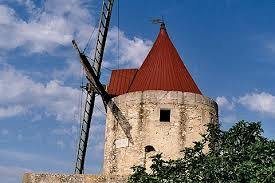 Accommodations and food in St Remy-de-Provence. 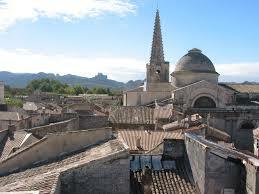 Tomorrow Part three of a Drive through the Alpilles, Tarascon and Les Baux de Provence.